Large arrange of products for Small Macaws. Food, treats, toys, cages, stands, perches & more. In this section you can find everything for your Small Macaw. Specialised food & treats, strong toys, spacious cages, stylish & practical stands, durable perches and much more. Everything in stock. Fast Delivery! Free Shipping on Orders over £39! 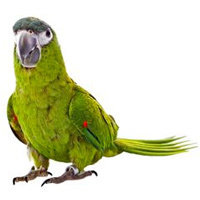 Worry not, having a Small Macaw as a pet is easy with Parrot Essentials' large selection of cages, accessories, foods, and more! Whether you have a Noble Macaw or Hahns Macaw, look no further for your feathered friend’s needs. Provide your parrot with a varied diet. Whether you choose complete foods, pellets, seeds, fruit and vegetable mixes, or even a mix of it all, ensuring your Small Macaw gets proper nutrition is important. With our large selection, neither you or your bird will be disappointed! If ever your bird becomes ill or simply needs an extra boost of vitamins and minerals, we have a selection of every day supplements. Along with supplements, we also have a selection of emergency care and treatment products. Your Small Macaw will never tire of our tasty treats. Our wide variety of snacks feature delicious treats that come in different flavours, textures, and brands, from Tweeter’s Fruity Jelly Mixed Flavour Cups to Vitakraft Rollinis’ bite sized treats. You and your Macaw will be delighted in the fact that with our wide wholesome selection you will never run out of healthy snacking options. Since birds have natural foraging behaviours, rest assured knowing your Small Macaw can continue their favourite activities with our range of different toys like chewing toys, climbing and swinging toys, and more. Housing your bird and providing them with a safe hideaway is important for the well-being of your bird. Lucky for your Small Macaw, we have cages assembled from strong and lightweight materials, that are then coated with non-toxic paint for a wonderful and bird-friendly finish. Parrot Essentials’ selection of bird cages features varied designs that is great for many uses, whether at home or during travel. For fun outside of their cage, try a parrot stand. Stands are great training aids or simply for Small Macaw to enjoy a change of scenery. Our selection includes lightweight stands, tabletop stands, and others. In addition to fun stands, give your pet accessories that are perfect for them as they lounge about or play around in their humble abode. Our accessories line has a festive variety of accessories that both macaws and owners will love!